Holy smokes! Are you guys feeling the heat yet?? I read recently that this summer was going to be a scorcher in most parts of the US, and they weren’t kidding. We are nudging 100ºF (!) here in mid-Missouri already, and I can feel the heat and humidity wrap me up like a warm blanket every time I step out of the house these days. You know what else is happening these days? My freezer is working overtime! 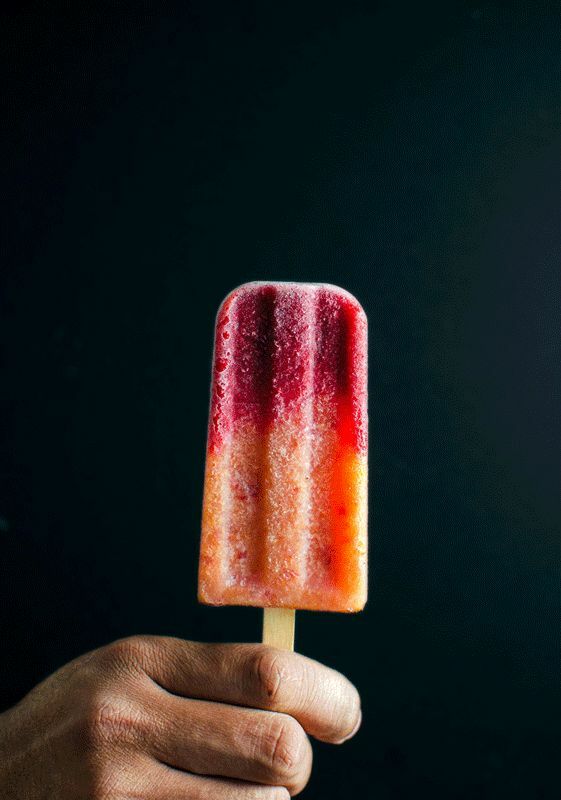 I’m not particularly fond of this heat (to put it very mildly), and I’ve been driven – yes, driven – to have a very formidable supply of popsicles in my freezer. Peach Melba as you guys know is a simple and classic dessert featuring vanilla ice cream, ripe peaches and a raspberry drizzle on top. It’s deliciously creamy and refreshing – the perfect summer treat! 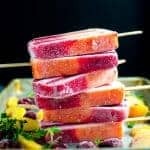 Here I decided to take the classic peach melba and turn it into a frozen dessert that’s dressed up for summer by making these amazing Thyme and Peach Melba Popsicles with delicious layers of fresh peach puree and raspberry puree, sweetened with thyme sugar syrup. So these are lighter and cooler than your classic peach melba because they don’t have creamy vanilla ice cream. It’s a fruitier version that’s PERFECT for the summer months and the bounty of peaches that’s ahead of us. And when you make the peach puree, always remember to add just a squeeze of fresh lemon (or lime) juice. The acidity balances out the sweetness, and brings out all the natural flavours of the peaches and raspberries. It really does make a world of difference, so make sure not to forget! 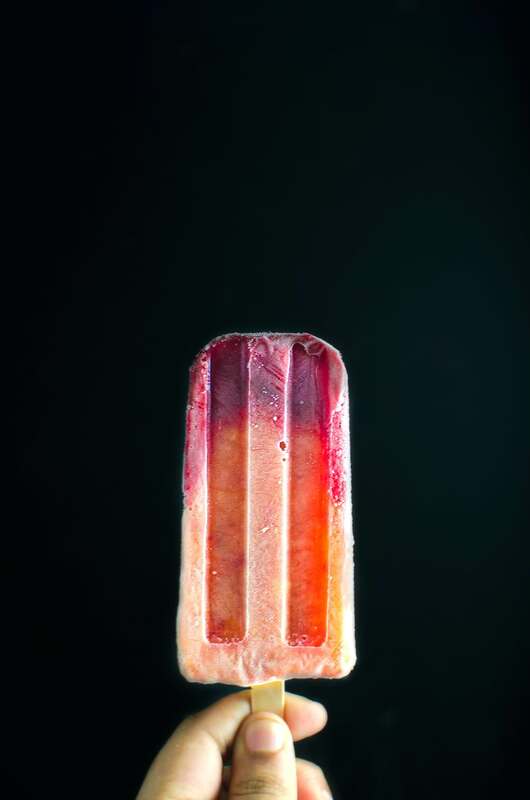 I also absolutely LOVE the technicolour ombre effect of these peach melba popsicles. They’re ALMOST too pretty to eat. Almost. In other blog news – I’m also SUPER excited to tell you guys about this little project that I’ve been working to get off the ground for a while now. I’m really happy to announce that I have partnered with Action Against Hunger to organize a fund-raising campaign to raise awareness and funds to fight world hunger and their mission to save lives of malnourished children in 45+ countries! So until the end of August, I’m banding together with a group of awesome food bloggers to raise funds for this amazing cause. And even if you’re not a food blogger, my dear lovely readers can also participate in this campaign. If you’d love to help us meet our goals for this fund raising event – you can CLICK HERE to donate through our crowdfunding page. Every penny (cent) that you contribute goes to Action Against Hunger, to be used in their programs to help fight hunger in countries all across the world. 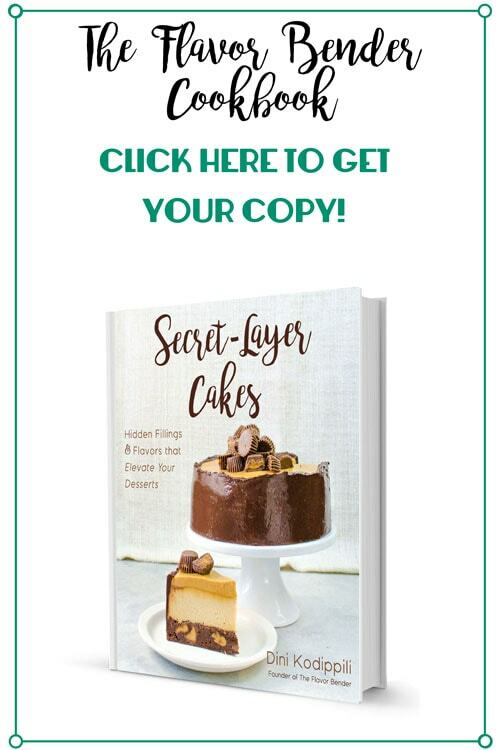 So if you are a food blogger or ANYONE who’d simply like to raise awareness about this campaign – just click here to find out how you can participate. Your support means the world to me, so THANK YOU! Place all the ingredients in a small saucepan. Bring the water to a simmer while stirring to dissolve the sugar. Simmer on low-medium heat for 10 minutes until the syrup thickens slightly, and then remove from the heat. Let the thyme sprigs remain in the syrup until the syrup comes to room temperature - or longer. If you’re using frozen peaches, let them thaw out first. Place the peaches and lemon juice in a food processor. Process until you have a smooth puree. Stir in the thyme simple syrup (1 tbsp at a time) to get the desired sweetness (I only used about 3 tbsp). Set aside. If you’re using frozen raspberries, let them thaw out first. Place the raspberries, lemon juice in a food processor and blend to get a smooth puree. Pass the puree through a sieve to remove the seeds. Stir in 1 tbsp of thyme simple syrup (I wanted the raspberry layer to remain fairly tart). Place about 1 ½ tbsp of raspberry puree in each of the popsicle molds (in the bottom ⅓ of the mold). Gently spoon in the peach puree to fill the popsicle molds (You won’t need to freeze the raspberry layer before adding the peach puree. Since the raspberry layer is thick, you only need to add the peach puree carefully and it will layer on top). Optional - use a popsicle stick to gently mix the interface between the two layers to create an ombre effect. Transfer popsicle molds to the freezer for at least a few hours until completely set. 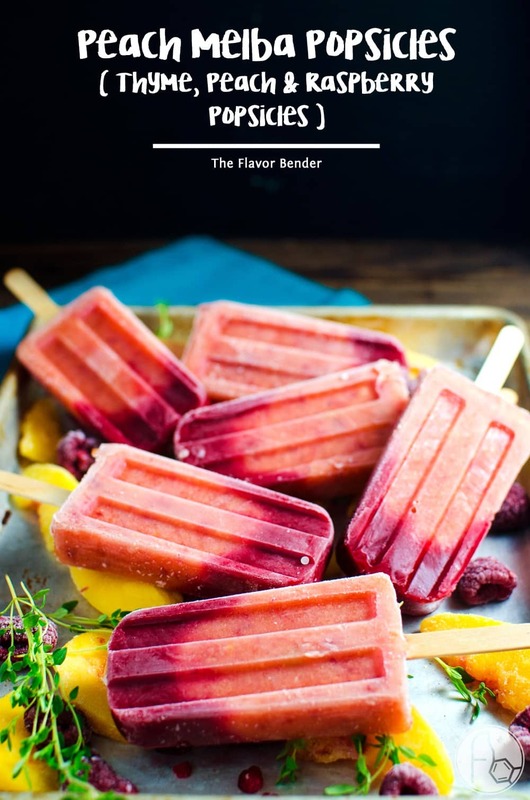 If you liked this peach melba popsicle recipe, don’t forget to subscribe for new (and free) recipes by entering your email address on the side bar (and get all these recipes delivered straight to your inbox), so you don’t miss out on a thing. You can find me on FACEBOOK, TWITTER, INSTAGRAM, PINTEREST, YOU TUBE and GOOGLE-PLUS too. Sounds delicious I will definitely be trying this. Thank you Eileen! 🙂 I hope you love these as much as we love em! Ok so I gotta say… I HATE peach fuzz, I always go for nectarines instead…. this might be a really silly question, but what happens to the fuzz when you blend the skin of the peaches??? In this recipe, because you’re basically pureeing the peach, the fuzz disappears into the puree, so it doesn’t really stand out! If you do hate fuzz, you can absolutely peal the peach before pureeing it too! Love these Dini! 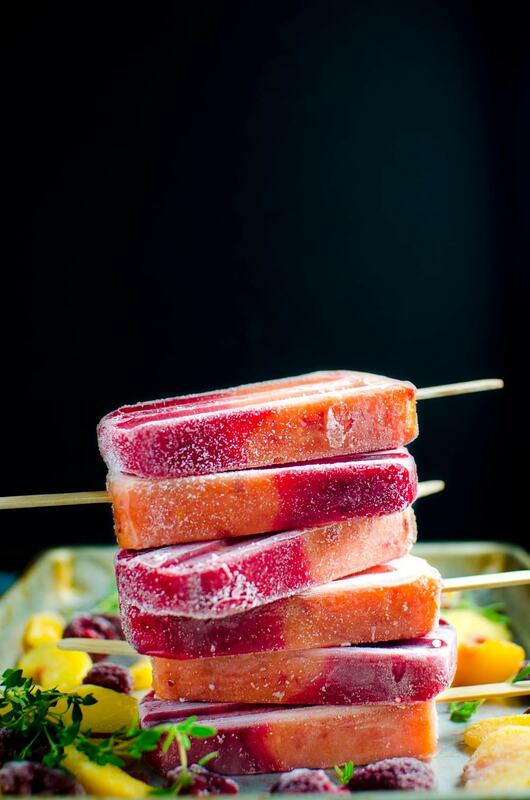 These might be the prettiest popsicles I have ever seen! Pinning! These look amazing! I am obsessed right now with anything with thyme or thyme syrup in it. I am seriously mouthwatering over these right now… You did an incredible job, love the ingredient selection and photography!